← Mastema is on Comixology! Some projects come to life easily. Others drag their nails into the vaginal walls of creation, screaming to stay in the mental womb forever. In the case of my most recent publication, Mastema, the latter was true. Luckily, I had had some minor successes before creating this book, and had managed to put out some material while it was being forced into the world. If Mastema had been my only focus during its long journey to fruition, I might have just quit along the way. For those of you who are frustrated or depressed about a project that is stuck in some sort of pre-publication purgatory, I offer this timeline of my own nightmare project. It took ten years to get from concept to publication (during which I have produced everything else in my body of work). It cost thousands of dollars to create which I have yet to recoup. 2005: My friends and I play a Dungeons and Dragons campaign that lasts several months. 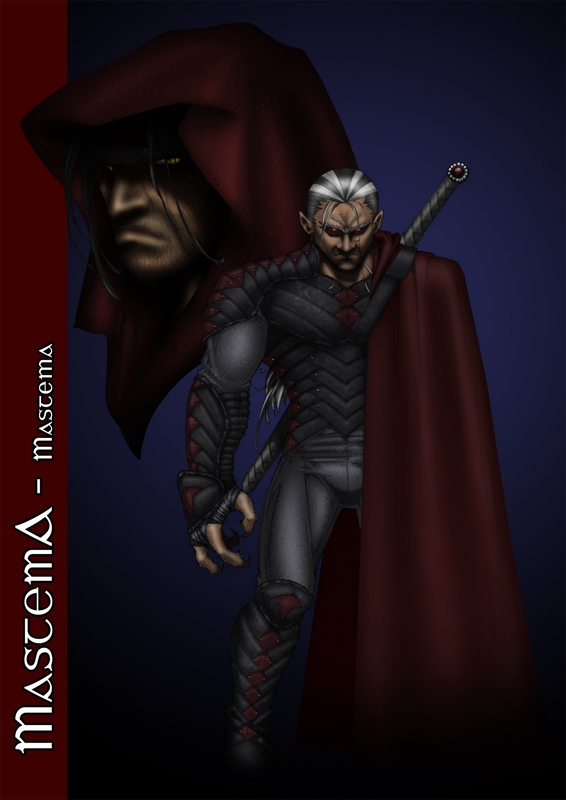 The most standout character is a demonic warrior named Mastema. In this original incarnation the character was an analogue for the anime character, Inyuasha. 2006- Wishing to make my own comics, I gather up ideas for an ongoing book. My top three concepts are Mastema (based very largely upon the character from the aforementioned D&D game), Kincaid (a conspiracy driven super-power book, sans spandex), and Faceless (a crime story that would later morph into Curse of the Black Terror). Though I ultimately chose to go with Kincaid for my first comic, I had a concept sketch of Mastema created. 2008- After self-publishing several comics, and writing several shorts for anthologies, I went back to the Mastema idea. I re-worked the character, moving him into a unique fantasy setting. I also gave him a more roguish personality, motivated by money, but wanting to help those in need when he could. I wrote the script around this new version of the character and called it A Devil’s Mercy. I submitted it to Polymancer Studios and received a polite rejection letter. Later that year, I competed In the Platinum Studios Comic Book Challenge. During that competition I started talking with Alex Chong who was also doing a book for the contest. After the competition was over, we decided to do a short comic together. I sent him the script for A Devil’s Mercy, he re-worked the character design, and we made the comic. Alex’s concept sketch for Mastema. 2009 – Alex and I submitted A Devil’s Mercy to Arcana studios, hoping to find a home for it an anthology. Instead, Arcana offered us a deal for a full length graphic novel. Alex and I signed the contract and I began work on the script for the much longer story, Sins of The Mother. 2010- Due to numerous financial and personal obligations, Alex was only able to produce six pages over the course of a year. Arcana kindly agreed to publish the book with a new artist. Alex stepped aside and Nico Leon stepped in as the line artist. Nico would also re-design all of the characters, save for Mastema himself. Nico’s concept sketch for Darius. 2011- Nico, in a little less than a year, designed numerous characters, shaped the visual flavor of the world, and drew the complete story, Sins of The Mother. Next we needed a colorist. At NYCC that year, I met Angel Aviles. We began talking at Buddy Scalera’s Creator Connection panel. Soon after the convention Angel signed on as the colorist. 2012-2013- Angel worked on coloring the book, trying to match Alex’s style as closely as possible. The rendering of the colors somehow came out too dark for print, and we didn’t realize it until Angel was about half way through the book. He had to go back to the beginning and adjust the colors for all the pages he had finished before moving on to the remaining pages. This whole process took the better part of two years, since Angel was only working on this during his free time. Arcana stayed patiently supportive. 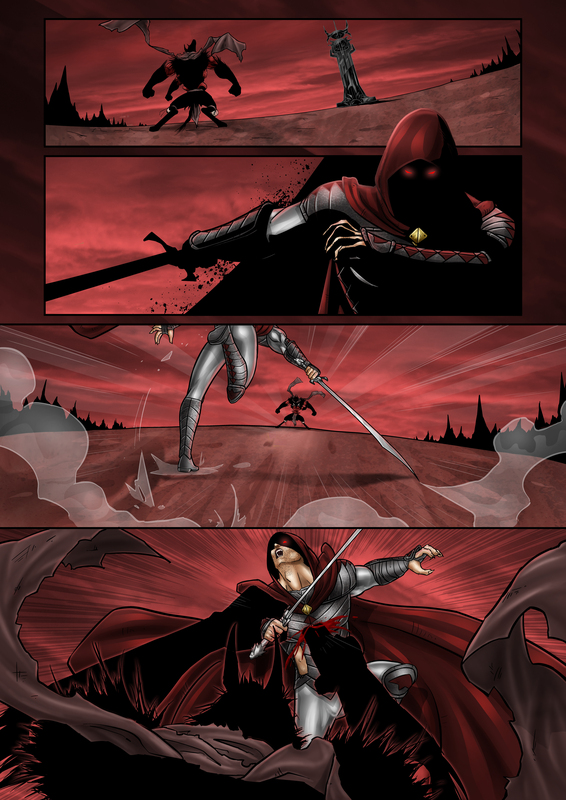 2014- All of the colored artwork for the Mastema graphic novel was finally finished. I had been lettering it along the way and most of it was complete. I put the words down on the final pages, created title pages and a back cover. Now all wrapped up, I delivered the book to Arcana. 2015- Arcana releases Mastema through Comixology. As of now, I’m not sure when it will be available in print, but expect it to be soon. You can purchase Mastema for just 5.99 at Comixology!